Mailbag: How has the drafting (or non-drafting) of running backs evolved over time? 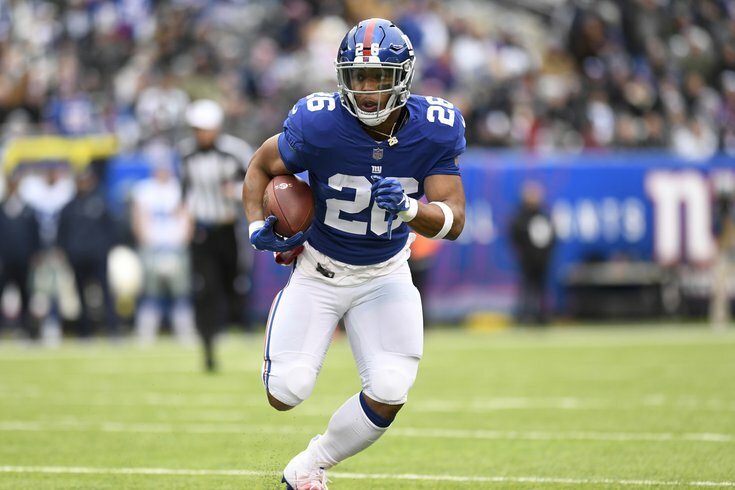 Saquon Barkley is an incredibly talented running back, which is great and all, except that the Giants still don't have a quarterback, and their options aren't very appealing. Question from Pawel P: You have told us many times that you don’t believe drafting a RB in the top of the first round is a good use of resources (I completely agree – lol Giants). With that in mind, what was your opinion back in the day of Eagles fans who were booing the Donovan McNabb pick, when they would have preferred Ricky Williams? Greetings from Poland to everyone! As the NFL has turned into more of a passing league, and more recently, as teams have gotten smarter about not over-drafting running backs, those number have fallen significantly. Question from Treven Tallent: What are the odds that Philly selects a LB with one of their second-round picks? Well, the two Devins (White and Bush) are going to go in the first round, very likely before the Eagles pick, not that they would draft a linebacker in the first round anyway. After that, I wouldn’t be surprised if no linebackers at all went in Round 2. It’s that bad a LB class this year. Question from The Dude: Isn’t it more likely that if Cody Ford or Jawaan Taylor drop that the Eagles would trade up to snag an offensive tackle? I understand the need for impact defensive linemen, but the Eagles have neglected OT for too long. In a trade-up scenario, go get the OT. To begin, I guess I’m a little confused on the “neglected” point. The have one of the best offensive tackles in the league in Lane Johnson, and have had one of the left tackles ever in Jason Peters. Despite that, two of their five picks last year were tackles, and they also drafted a tackle in 2016. I don’t see neglect there. As for the idea to trade up for one, I just don’t see that at all. If an offensive tackle is there at 25, and you think he can be a good starter immediately at guard, with the potential to play OT in the future, then sure, go get him. But if they trade up, I’d be very surprised if it weren’t for an impact player who they also think can help immediately. Question from Mike: In theory, how high could the Eagles’ first- and two second-round picks get them in the first round? Top 5-10? The draft value chart says that should get them to pick No. 8. Question from Bob: Do you have other niche NFL policies lined up to add to your expertise in the event that the NFL does away with compensatory picks? Unfortunately, no. I will say this, though: I get asked a fair amount for advice on how to break into this business, and one of things I always tell people is to find a way to stand out. Offer something from a content perspective that nobody else is doing. As in, give people a reason to you read your stuff in addition to the people they're already reading regularly. One of the things I did every year, along with a friend who actually did most of the heavy lifting, was write a compensatory pick projection post for the whole league. This was before OverTheCap.com even existed. We did OK. We’d get like 23 or 24 out of 32 right, as in picks matched to the team and round, but we were nowhere near as good as OverTheCap is now. To my knowledge, we were the only ones doing it, and that post did enormous numbers every year on my old crappy blog. Anyway, it was during those years that I learned all about comp picks, and it really paid off in a big way this offseason. But for those of you trying to be sportswriters, find your “comp pick expertise,” learn the crap out of it as best as you can, and run with it. Question from The Guy: Have you ever had a good stuffed pretzel from the register at Wawa? I’m always let down. The jalapeño bites were better, if overpriced. Those stuffed pretzels are awful. Wawa should either get rid of them completely or go back to the drawing board on those. My favorite Wawa-made register item is the chocolate chip cookie. Those are really good.